Bhubaneswar: For the first time in the city the heritage scene seemed rejuvenated with the ongoing 5th International Biennial Conference of Indian Heritage Cities Network and the Temple City experienced two heritage walks in two circuits. 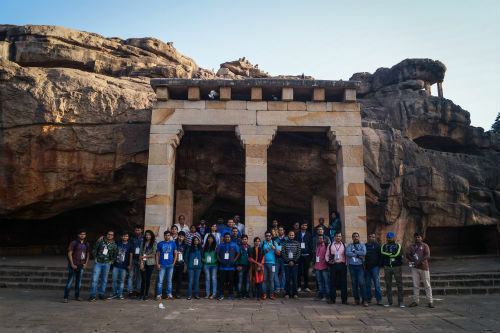 While the 9th Monks, Caves and KIngs at Khandagiri happened in the morning, a special Ekamra Walks Old Town Circuit was organised in the afternoon for the delegates of the IHCN conference, being held at Infosys by Odisha Government, IHCN and UNESCO. 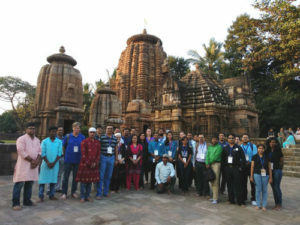 While 40 people including six students of Indian Institute of Tourism and Travel Management (ITTM), Bhubaneswar and two IIM Bangalore pass-out couple (husband and wife) participated in the morning heritage walk, 20 people from the conference including noted architects, planners, urban designers, artists and students and faculty members of different architect colleges and administrators joined the heritage walk. Kiran Joshi, Chitrakara School of Planning and Architecture, Chandra Shova Shakya, Head Heritage and Culture Conservation Section of Lathipur Metropolitan City, Nepal, Dr. Garyfalia Palaiologou, Lecture in Architecture from Loughborough University, England, Dr. Ester Steekelenburg, Director Urban Discovery, Hongkong were some notable members of the Special Ekamra Walks. All the guests were delighted to see the “jugalbandi’’ of classical music with the heritage walk in the beautiful precinct of Mukteswar Temple, which is the epitome of temple architecture under the Kalingan Style and Guide Satyaswarup Mishra explained them the details with the hints that how there is a influence of Jain, Hindu and Buddhish philosophies in the images of our temples of Ekamra Kshetra as the area was known in the ancient times and how the temple architecture evolved from 6th Century AD and flourished with distinctive format, i.e. Rekha, Pidha and Khakara types of temples. The visitors also went to Ekamra Van, the medicinal plant garden on the bank of Bindusagar, which has more than 200 different varieties of rare and other plants, which are very useful in everyday life. ACF Ashok Kumar Mishra explained the concept, plan and specialty of the medicinal plant garden to the visitors and they spent over an hour in the unique garden. Gaurav Kedia and Sabia Jindal both from IIM Bangalore Class of 2013. Both are from Jharsuguda and are working as entrepreneurs in the field of ISP and they are husband and wife. Both Gaurav and Sabia said “the walk was really amazing and we could see the Twin Hills in a different perspective after today’s heritage walk. 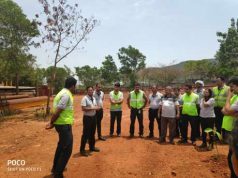 Satyajit Barun Day, an executive engineer with local office of Central Public Works Department (CPWD) was also the guest at Monks Caves and Kings. He also enjoyed and added that he would invite other friends to the heritage walks of the city. Meanwhile at the second day of the 5th International Biennial Concerence of IHCN in the discussion involving artists, architects, planners, administrators, consultants and experts, discussion was done how to carry forward the heritage thought. The dialogue primarily focused on the need to have one body which brings together the various different stakeholders from State Government, to INTACH to ASI, State Archaeology, UNESCO, ICOMOS etc to oversee the heritage activities of the city. 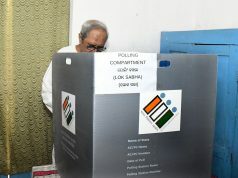 It also called for looking towards towards CSR for funding opportunities, providing important to see the economics of heritage – set up heritage observatory that studies the various aspects from an economic point of view and also had an effective discussion on one state one project, where one can call for submission of one important project from each state to finally submit it to international bodies.